Serves 2, takes 30 minutes. Spring seems to have finally arrived and asparagus is in season! This asparagus pasta dish is a quick, fresh meal that also contains lemon, basil and mint. It is a perfect recipe for a weeknight dinner. It is made more substantial by the addition of chopped almonds. I love the combination of asparagus and lemon with the fresh herbs. Here, I’ve added both lemon zest and a bit of lemon juice to brighten up the entire dish. You can use roasted almonds if you don’t want to spend the time toasting the almonds yourself. However, I have found a really quick and easy way to toast almonds (and all nuts, for that matter) if you have a toaster oven. This saves energy and time because you don’t have to heat the entire oven just to toast a few almonds. Preheat the toaster oven to 350oF for a few minutes. 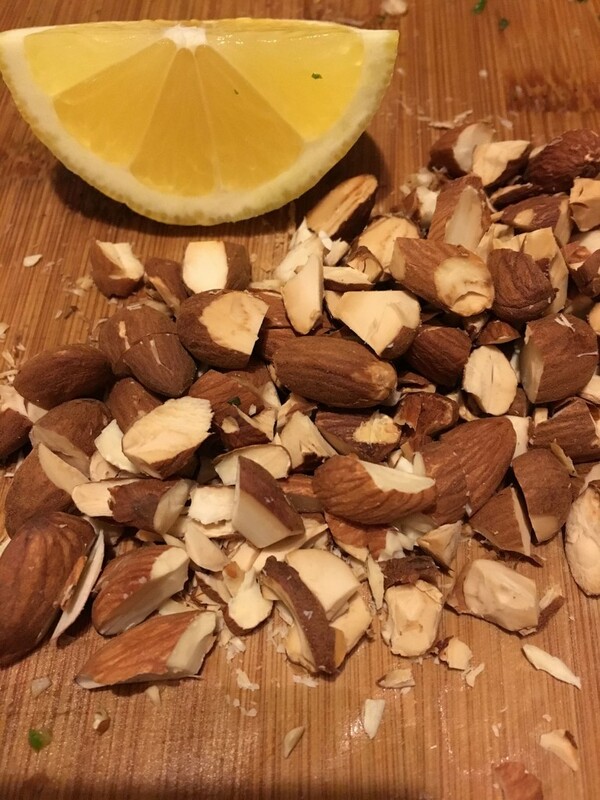 Place the almonds on the toaster oven baking tray and roast in the toaster oven for about 5 minutes, until almonds are aromatic and well-toasted. Be attentive! The almonds will burn very quickly if left just a little bit too long in the toaster oven. For the pasta, I prefer to use linguine or fettucine. However, any type of pasta works here. When I made the recipe for this post, I used rigatoni because I didn’t have any type of long strand pasta in my pantry. I have also successfully used penne in this recipe. 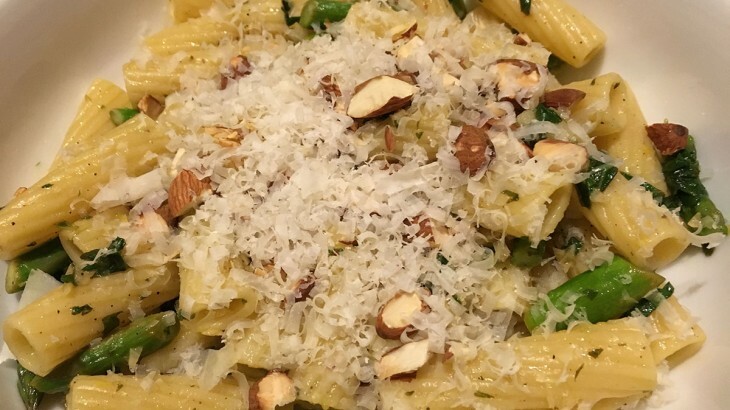 This recipe is vegetarian, but can easily be made vegan by omitting the parmesan cheese. This asparagus pasta dish tastes great accompanied by a nice Chardonnay. Heat olive oil in a sauté pan over medium-high heat and add garlic. Cook garlic for about 30 seconds, without browning. Add sliced asparagus to pan and sauté for about 2 minutes, stirring constantly, until asparagus is cooked but still crisp-tender. Season with salt and pepper. Turn off heat. Add chopped basil, mint, and lemon zest and stir for a few seconds until herbs are wilted. 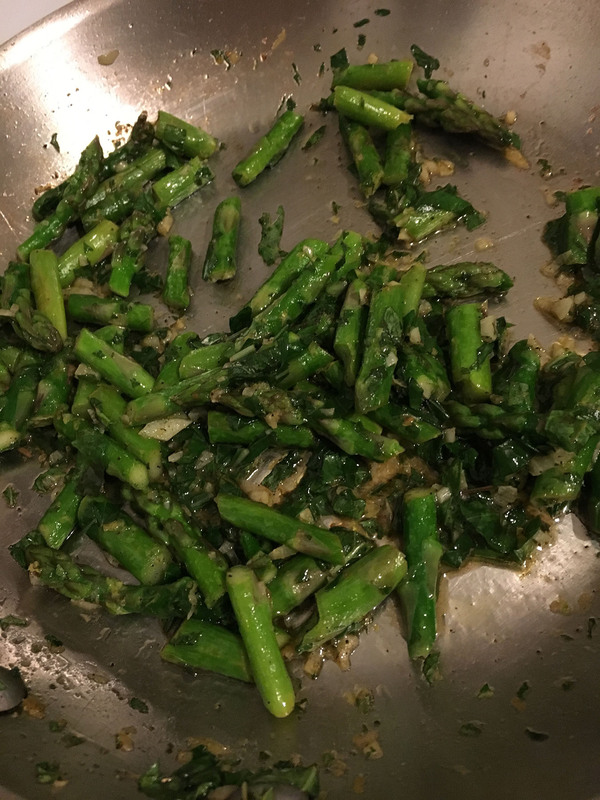 Season herb and asparagus mixture to taste with a bit of lemon juice, salt and pepper. Meanwhile, while asparagus is cooking, cook pasta in salted water according to package instructions. 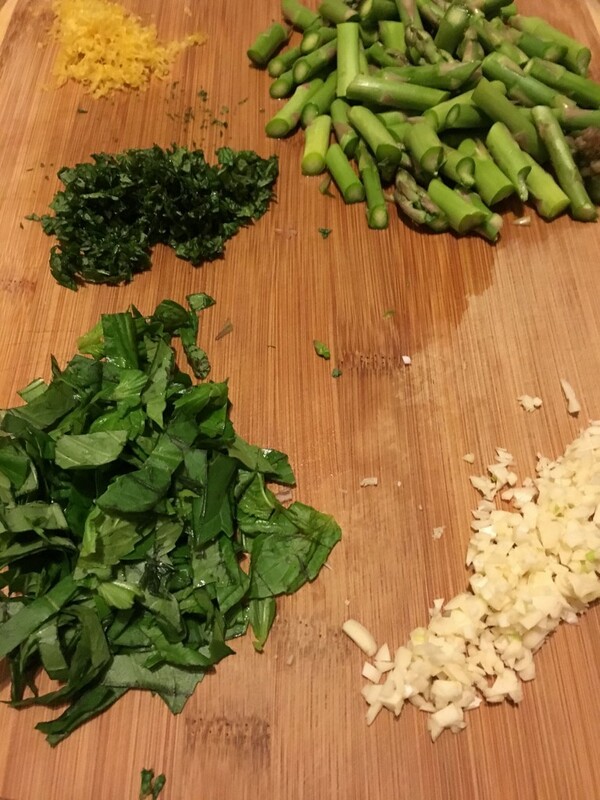 Drain pasta and add to sauté pan with asparagus. Toss pasta with asparagus mixture to evenly distribute vegetable mixture throughout pasta. Divide pasta into two large bowls. Scatter toasted almonds evenly between the two bowls. Sprinkle parmesan cheese and additional black pepper over the top of pasta.